In your December Vegan Box you will find a gorgeous Detox Tea from Sol Cleanse! Aside from this beautiful product, the team at Sol Cleanse also offer wonderful cleansing and detoxing programs delivered fresh to your front door around the Gold Coast and beyond. Meet the team, hear their story and learn why they love what they do! What made you start up Sol Cleanse? 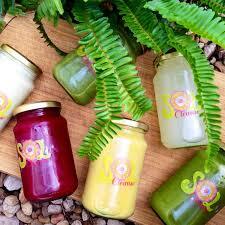 Sol Cleanse was born out of a desire to bring our passion for healthy, vibrant living to others. With our strong background in health we felt that we could share our knowledge with others and deepen their own personal journey towards health and happiness. We also felt that we could bring more to the cleanse experience than just juice. So we also focus on the unique ability that cleansing has to uplift mind, body and soul. We provide additional support with daily inspirational emails, yoga videos and post-cleanse menus for a complete holistic transformation. Do you feel like there is a big shift in the general public towards healthier ways of living? There is definitely a big shift in consciousness towards living a more holistic lifestyle. It is truly great to see. From practicing yoga, to eating organic to juice cleansing- people seem to be really embracing a more holistic lifestyle which is amazing. A lot of time and energy goes into lovingly creating our organic juice cleanse programs for our wonderful sol seekers. We take time to connect with our local farmers who supply us with our organic produce. We spend time replying to emails, preparing orders, connecting to other like-minded businesses, spreading the Sol Cleanse love, and of course having fun! Miriam and I are both new mums, so we love spending lots of quality time with our new bubs as well. Have you had wonderful feedback from your clients so far with the cleanses? Yes. We have had such amazing feedback from our beautiful clients. It makes my heart fill with love when I hear how people have enjoyed their cleanse. Our clients transformations are always so inspiring. Are you planning on developing more products such as the detox tea for people to buy online? Yes! Our Be Light detox tea is currently available on our website and we have a few exciting plans for more new products in the near future. Stay tuned! It seems you are also very passionate about things like sustainability and the environment, how do you contribute positively to these through the business? marketing in hopes that you will reuse your bottles. We utilize recycled paper for our printing and stationary. We provide a stainless steel reusable straw with each cleanse. We love and care for our planet and we hope to become even more sustainable in the future! What is your favorite thing about doing what you do? My favorite thing about being a part of Sol Cleanse would be reading the beautiful emails that come in from our clients. It is so incredible to hear people’s transformations and how our programs are inspiring people to live a life more connected to their true selves.